EPI Associate Labor Counsel Marni von Wilpert sent the following comment to the U.S. Department of Labor, Office of Labor-Management Standards, on August 9, 2017. Attention: RIN 1245-AA07 – Interpretation of the Advice Exemption in Section 203(c) of the Labor-Management Reporting and Disclosure Act. I am submitting this comment as the Associate Labor Counsel at the Economic Policy Institute. I write this comment in opposition to the Department of Labor’s (DOL) June 2017 proposal (81 Fed. Reg. 15924) to rescind the final rule titled, “Interpretation of the ‘Advice’ Exemption in Section 203(c) of the Labor-Management Reporting and Disclosure Act” (the “Persuader Rule”), issued on March 24, 2016. (82 Fed. Reg. 26877). In this comment, I first show that the Persuader Rule is consistent with both the purpose and legislative history of the Labor-Management Reporting and Disclosure Act of 1959 (LMRDA). Second, I explain why the four reasons that DOL has presented for rescinding this rule do not justify its rescission, and I show that they, in fact, contravene the purpose of the LMRDA itself. The 1959 Senate Committee Report accompanying the LMRDA stated that persuader activities “are disruptive of harmonious labor relations and fall into a gray area” between proper and improper conduct. (S. Rep. No. 86-187). To address this potential for harm, Congress chose to rely on transparency through disclosure and reporting of persuader activities, instead of outright prohibiting such activities. As Justice Brandeis once famously said, “Publicity is justly commended as a remedy for social and industrial diseases. Sunlight is said to be the best of disinfectants; electric light the most efficient policeman.”6 Public disclosure of union-avoidance consultant activities allows employees in the workplace, like voters in the political arena, to understand the source of the information they are given during the course of a union election campaign. By enacting the LMRDA, Congress intended that employees be given the knowledge that a third party—the consultant hired by their employer—is the source of the anti-union information. Despite the congressional mandate to require employers and anti-union consultants to disclose their persuader activities, a significant amount of persuader activity has gone unreported because of a loophole in DOL’s regulations. The LMRDA does not require employers and anti-union consultants to report if the consultant is only giving “advice” to the employer. (29 U.S.C. § 433(c)). But the LMRDA does not define the term “advice,” and so it has been up to DOL to issue regulations delimiting what types of activities must be reported. On March 24, 2016, following notice and comment rulemaking that began in June 2011, DOL issued its final Persuader Rule, closing the loophole by reinstating the LMRDA’s requirement to report both direct and indirect persuader activity. As DOL explained in the final rule, “[t]he prior interpretation failed to achieve the very purpose for which [LMRDA] . . . was enacted—to disclose to workers, the public, and the Government activities undertaken by labor relations consultants to persuade employees—directly or indirectly, as to how to exercise their rights to union representation and collective bargaining.” (81 Fed. Reg. 15926). And the LMRDA states that DOL shall “have authority to issue, amend, and rescind rules and regulations . . . necessary to prevent the circumvention or evasion of [LMRDA’s] reporting requirements.”11 Accordingly, in issuing the final rule, DOL fulfilled its congressional mandate by closing the reporting loophole for indirect persuader activities. In its June 2017 Notice of Proposed Rulemaking (NPRM), DOL listed four reasons for rescinding the rule: (1) to allow DOL to engage in further statutory analysis; (2) to allow DOL to consider the interaction between Form LM-20 and Form LM-21; (3) to allow more detailed consideration of attorneys’ activities; and (4) because DOL has limited resources and competing priorities. None of these reasons justify rescinding the Persuader Rule. 1. DOL already engaged in a thorough statutory analysis when it issued the rule. In its NPRM proposing to rescind the rule, however, DOL cited a Texas district court’s injunction as a reason to engage in further statutory analysis. But rescinding a properly promulgated rule based on a single trial court’s order in a lawsuit initiated by regulated business groups is a dereliction of DOL’s duty to protect the rights of workers. And, in fact, two other district courts, in Minnesota and Arkansas, did not issue preliminary injunctions when reviewing similar challenges to the rule.15 Moreover, the Texas district court decision is currently on appeal to the United States Court of Appeals for the Fifth Circuit—a court that has sided with “the Government’s view” of the LMRDA when interpreting the statute’s reporting and disclosure requirements in a prior case.16 DOL should await the results of the appeal rather than taking the extraordinary step of initiating the process of rescinding the rule under the Administrative Procedures Act based on a single district court’s decision. 2. DOL does not need to rescind the Persuader Rule in order to consider how the rule affects Form LM-21. DOL does not need to rescind the Persuader Rule (which affected only Forms LM-10 and LM-20) in order to consider how the rule affects Form LM-21. Instead, DOL should leave the final rule in place, and proceed with rulemaking for Form LM-21. In its fall 2015 Semi-Annual Regulatory Agenda,17 DOL announced that OLMS intended to pursue a rulemaking to revise Form LM-21,18 and issued a special non-enforcement policy for Form LM-21 while the rulemaking was pending. Instead of rescinding a properly promulgated final rule, DOL should just proceed with its previously stated goal of updating Form LM-21. 3. DOL does not need to further consider attorneys’ roles under the LMRDA—multiple appellate courts have held that if attorneys act as persuaders, they must report. The question of when attorneys’ activities must be reported under the LMRDA has been asked and answered: when attorneys engage in persuader activity, they must report just like any other anti-union consultant. There is no need to rescind the final rule on this basis. 4. DOL’s mandate is to use its resources to safeguard workers’ rights; statutorily mandated disclosure of union-avoidance activities should be a priority in light of that mandate. DOL’s mission is to safeguard the welfare of America’s workers by, among other things, “strengthening free collective bargaining.”26 The Persuader Rule would further DOL’s mission by taking a modest step toward leveling the playing field for workers by making sure they receive the information they deserve before making a decision on forming a union. Indeed, as reports from the Economic Policy Institute have shown, the single largest factor suppressing wage growth for working people over the last few decades has been the erosion of collective bargaining.27 And as union membership has fallen over the last few decades, the share of income going to the top 10 percent has steadily increased, as shown in Figure A. Data on union density follows the composite series found in Historical Statistics of the United States; updated to 2014 from unionstats.com. Income inequality (share of income to top 10 percent) from Piketty and Saez, “Income Inequality in the United States, 1913–1998,” Quarterly Journal of Economics vol. 118, no. 1 (2003), 1–39. Updated data for this series and other countries, is available at the Top Income Database. Updated 2016. Instead of using its resources to initiate a lengthy process to rescind the final rule, DOL should be targeting its resources to protect America’s workers’ fundamental rights to join together improve their wages, working conditions, and ultimately, their lives. 1. 81 Fed. Reg. 15930 (citing S. Rep. No. 86–187, at 10, 1 LMRDA Leg. Hist., at 406). 2. 81 Fed. Reg. 15933 & n.10 (citing studies). 3. See, for example, the Labor Relations Institute, Inc.’s “Fighting a Union” webpage, available at http://lrionline.com/fighting-a-union-3/ (last visited July 28, 2017). 4. Marni von Wilpert, “Union Busters Are More Prevalent Than They Seem, and May Soon Even Be at the NLRB,” Working Economics (Economic Policy Institute blog), May 1, 2017, available at http://www.epi.org/blog/union-busters-are-more-prevalent-than-they-seem-and-may-soon-even-be-at-the-nlrb/. 5. 81 Fed. Reg. 15956. 6. Buckley v. Valeo, 424 U.S. 1, 67 (1976) (quoting from L. Brandeis, Other People’s Money [National Home Library Foundation, 1933], 62). 7. 29 U.S.C. § 433(a) (emphasis added). Section 203(b) contains a similar reporting requirement for union-avoidance consultants. 8. 81 Fed. Reg. 15925; see also Memorandum from Charles Donohue, Solicitor of Labor regarding “Modification of Position Regarding ‘Advice’ under Section 203(c)” of the LMRDA, February 19, 1962. 9. 81 Fed. Reg. 15925. 10. 81 Fed. Reg. 15925. 11. 29 U.S.C. 438; 81 Fed. Reg. 15929. 12. Number of comments received is shown in the right-hand column of the “request for comments” page, available at https://www.regulations.gov/document?D=LMSO-2011-0002-0001. 13. 81 Fed. Reg. 15924–16051. 14. 81 Fed. Reg. 15926. 15. Labnet, Inc. et al v. U.S. Dep’t of Labor et al., Case No. 0:16-CV-00844 (D. Minn); NFIB v. Perez, Case No. 5:16-CV-00066 (N.D. Tex. ); Associated Builders and Contractors of AR v. Perez, Case No. 4:16-cv-00169-KGB (E.D. Ark). 16. Price v. Wirtz, 412 F.2d 647, 649 (5th Cir. 1969) (en banc). 19. Humphreys v. Donovan, 755 F.2d 1211, 1216 (6th Cir. 1985); accord Price v. Wirtz, 412 F.2d 647, 651 (5th Cir. 1969) (en banc). 20. See, e.g., Humphreys et al v. Donovan, 755 F.2d 1211, 1219 (6th Cir. 1985); Wirtz v. Fowler, 372 F.2d 315, 332-33 (5th Cir. 1966), rev’d in part on other grounds, Price v. Wirtz, 412 F.2d 647 (1969); Douglas v. Wirtz, 353 F.2d 30, 33 (4th Cir. 1965). 21. Price v. Wirtz, 412 F.2d 647, 650 (5th Cir. 1969) (en banc). 22. Letter from law professors to Chairman Kline and Ranking Member Scott, May 16, 2016, available at http://democrats-edworkforce.house.gov/imo/media/doc/Law%20Professors%20Persuader%20Rule.pdf. 23. Letter from labor attorneys to Chairman Kline and Ranking Member Scott, May 17, 2016, available at http://democrats-edworkforce.house.gov/imo/media/doc/5%2017%2016%20labor%20lawyer%20persuader%20letter.pdf. 24. 81 Fed. Reg. 15942. 25. 81 Fed. Reg. 15929. 27. 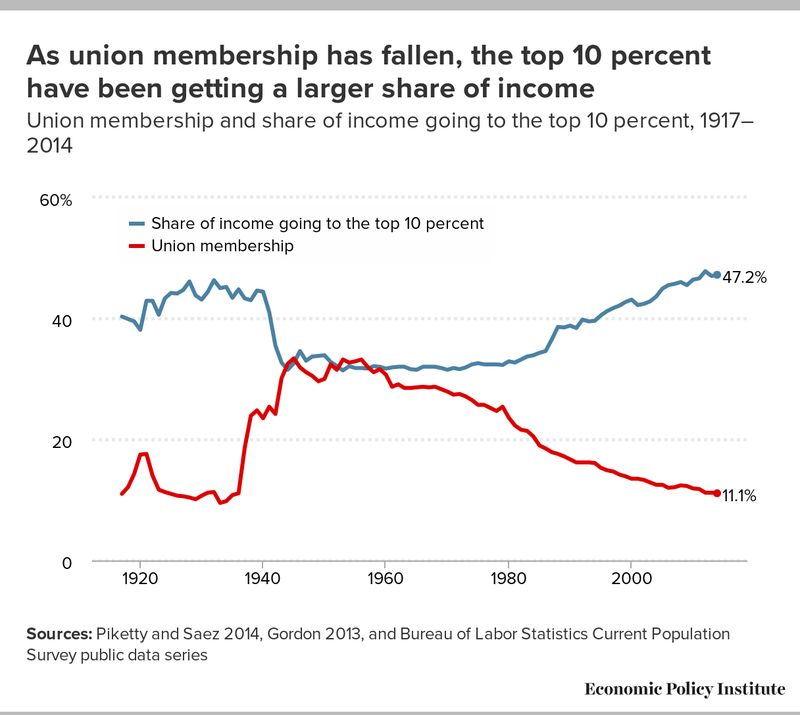 Lawrence Mishel and Jessica Schieder, “As Union Membership Has Fallen, the Top 10 Percent Have Been Getting a Larger Share of Income,” May 24, 2016, available at http://www.epi.org/publication/as-union-membership-has-fallen-the-top-10-percent-have-been-getting-a-larger-share-of-income/.